The term opiates refers to the alkaloids found in opium, an extract from the seed pods of the opium poppy (Papaver somniferum L.). It has also traditionally referred to natural and semi-synthetic derivatives of morphine. The term is often incorrectly used to refer to all drugs with opium-/morphine-like pharmacological action, which are more properly classified under the broader term opioid. 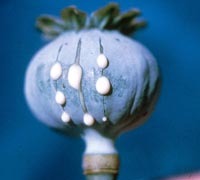 The main opiates from opium are morphine, codeine and thebaine. Opiates are used medicinally to relieve pain and induce sleep. These opiates include codeine , morphine , the morphine derivative heroin , and, formerly, laudanum. Sometimes included in the group are certain synthetic drugs that have morphine-like pharmacological action. All opiates are considered controlled substances by U.S. law and are available only by prescription. Heroin is not available legally at all in the United States. The abuse of opiates is associated with serious health conditions, including fatal overdose, spontaneous abortion, collapsed veins, and, particularly in users who inject the drug, infectious diseases, including HIV/AIDS and hepatitis. It is very important to get the use of this drug stopped. One of the ways to do that is to do regular urine drug testing of the person who is using opiates. The short-term effects of Opiates appear soon after a single dose and disappear in a few hours. After an injection of heroin, the user reports feeling a surge of euphoria ("rush") accompanied by a warm flushing of the skin, a dry mouth, and heavy extremities. Following this initial euphoria, the user goes "on the nod," an alternately wakeful and drowsy state. Mental functioning becomes clouded due to the depression of the central nervous system. Long-term effects of heroin appear after repeated use for some period of time. Addiction to Opiates affects the users central nervous system. After using opiates for a prolonged period of time, the nerve cells in the brain, which would otherwise produce endogenous opiates (natural painkillers, or endorphins), cease to function normally. The body stops producing endorphins because it is receiving opiates instead. The degeneration of these nerve cells causes a physical dependency to an external supply of opiates. Abrupt or sudden abstinence from opiates induces yet another traumatic problem, withdrawal from opiates. Opiate withdrawal is caused by stopping, or dramatically reducing, the use of opiates after heavy and prolonged use (several weeks or more). Opiates include heroin, morphine, codeine, Oxycontin, Dilaudid, methadone, and others. The reaction frequently includes sweating, shaking, headache, drug craving, nausea, vomiting, abdominal cramping, diarrhea, inability to sleep, confusion, agitation, depression, anxiety, and other behavioral changes. About 5% of the population is believed to misuse opiates, including illegal drugs like heroin and prescribed pain medications such as Oxycontin. These drugs can cause physical dependence. This means that there is a reliance on the drug to prevent symptoms of withdrawal. Over time, greater amounts of the drug become necessary to produce the same effect. The time it takes to become physically dependent varies with each individual. When the drugs are stopped, the body needs time to recover, and withdrawal symptoms result. Withdrawal from opiates can occur whenever any chronic use is discontinued or reduced. Some people even withdraw from opiates after hospitalization for painful conditions without realizing what is happening to them. They think they have the flu, and because they don't know that opiates would fix the problem, they don't crave opiates.